Latest images related to Attitude Magazine Thailand. Click on any thumbnail to see full image. We have 23 images related to the tag "Attitude Magazine Thailand" Click Here to scroll down to the full image gallery. Pick up the November issue of Attitude Thailand, the Thai language gay lifestyle magazine, at newstands now. 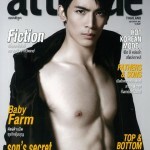 Attitude Thailand Magazine – its May! Gallery of images related to Attitude Magazine Thailand Click on any thumbnail to see the gallery. Note: images may cover various related topics depending on what article they appeared in and may not be specifically about the Tag in question.